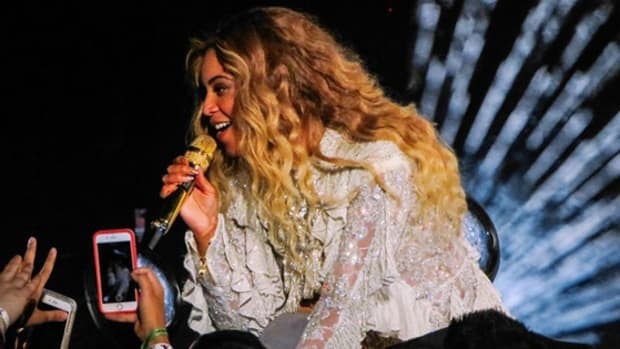 Uncasville, CT -- After falling Dangerously In Love on her first solo tour and reaching a new level of maturity with The Beyoncé Experience, Beyoncé has found self-actualization on her currently-running I Am… tour. Last Thursday, July 23rd, Uncasville, CT&apos;s Mohegan Sun, the pop starlet gave fans an up-close and personal look at the latest stage in her evolution as a musician and a performer. After an opening set by up-and-coming foursome RichGirl, Beyoncé rose from the stage and strutted down the stairs with two backup dancers at her heels, diving right into the brash, horn-driven groove of “Crazy In Love.” Futuristically glamorous in a costume by Thierry Mugler, B glimmered as she literally flew through the air—on wires—to the Eastern handclaps of “Baby Boy.” During the sassy “Get Me Bodied,” the backup dancers took over as Beyoncé donned a white outfit for the next portion of the show. After the upbeat dance numbers, the singer slowed it down with stirring renditions of power ballads “At Last” and’ “Listen.” These selections had many members of the audience expecting the singer to delve into the deeper cuts off her I Am…Sasha Fierce LP, but Beyoncé upped the ante, instead launching into a Destiny’s Child medley. Segueing from the ’70s shake of “Bootylicious” into the acoustic-guitar groove of Darkchild-produced classic “Say My Name” (with which she serenaded one lucky fan); and ending with the empowering “Bills, Bills, Bills,” Sasha Fierce performed her former group&apos;s hits with swagger to spare. Though B&apos;s brief cover versions of tracks by Dido and Alanis Morrissette were undeniable highlights, the night&apos;s most memorable moment came later, when the singer launched into a powerful performance of B&apos;day single “Irreplaceable;” while this writer was less than fond of the Stargate-produced track, the sight and sound of ten thousand fans breaking into song without one word from the performer had to be experienced to be believed. After ending her set with hand-twisting hit “Single Ladies,” Beyoncé returned to the stage to pay tribute to the late Michael Jackson with a rousing rendition of “Halo.” The singer&apos;s tribute to the musical legend was a fitting end to a spectacular show—and few in attendance that night could deny that B is well on her way to standing alongside MJ in the ranks of pop royalty.